My hat is off to Carey Nieuwhof. When it comes to blog posts that equip leader like never beofre, he is knocking them out of the park. God didn’t decide his work was good enough, so why should the church? He gave his best. His all. He threw the full force of his majesty not just into creation, but into redemption. Strangely, many people will give 100% to the marketplace, a hobby or their family, and then give 60% when they serve God. Makes no sense. At all. Ever since I was a kid, I’ve had this dream. Part of me still goes to concerts thinking this might happen. I probably need to buy better seats, now that I think about it. I want to address this last point. It does make sense. Sometimes. In the beginning of Genesis, we get to see God as the penultimate artist, working through matter and time, shaping the very nature of all things. It’s breathtaking and inspiring, isn’t it? It’s art. We see that art come alive in the Creation: From nothing, everything, everything from dust. In glimpses, that Divine artistry is mirrored in millions of ways. Things like: Picasso painting, or Caruso singing, or Michelangelo chiseling, or Emma Stone acting, or my accountant crunching my taxes, or your lawn guy turning that shrub into a dolphin smoking a cigar, or this guy shredding Keith Urban’s guitar. Jesus was a passionate dude. You can see the art of heaven in everything he did. As we reflect Christ in our lives, our skills become our art and our art is our gift. We spend so much of our lives building our skills: creative skills, administrative skills, accounting skills, driving skills, listening skills, teaching skills, musical skills, waitering skills, communicating skills, programming skills, managing skills, or…absolutely worthless skills like grand theft auto or wet burping the Star Spangled Banner. What we can do is so important. For many of us, what we can do is how we earn a living. No matter what it might be, our art is tied to our livelihood. It’s also intimately tied to our spiritual life. Sure we want to be noticed in the work place, in the classroom, but we want what we have to offer to make a difference in the places that matter most. And the Church is one of places. It’s not often that a superstar let’s someone come up from the front row and steal the show. But it happens. Ever since I was a kid, I’ve had this dream. Part of me still goes to concerts thinking this might happen…I probably need to buy better seats, now that I think about it. 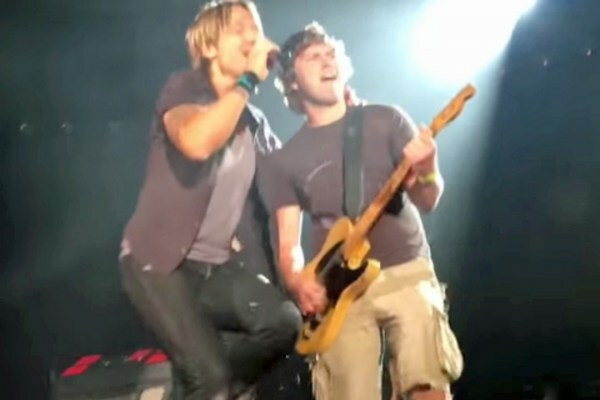 Church leadership needs to make a shift and adopt the Keith Urban approach: Let people do the cool stuff. The problem with volunteerism in the church might have less to do with numbers and more to do with lack of art. Our Spirits long for who we are to make where we are better through what we can do, what we love to do. Our Spirits long for who we are to make where we are better through what we can do, what we love to do. If you had Rob, the Keith Urban guitar shredding birthday boy, in your church would you want him playing guitar or folding bulletins? It’s obvious, right? And yet, the bulletins have to get folded. How many passionate people do we snuff out because we aren’t making room for them to shine? For them to do what they are great at doing? What they were created to do? Why do we invest in jobs and find people to do them instead of investing in people then finding a job that makes sense for them? I think that when you have a guy that can play like that and we ask him to hand out paper cups on a hot day with an attitude of gratitude…well, we get gratitude fatigue. That’s why we give 60%. It’s not about God. God has given his best to me, to you, to all of us. We want to give our best back. But our best. The thing that we do best. Our art. The thing that makes us feel alive, even if it’s for just on hour a week.